I had a great view of the stars last night. I can easily get lost up there for hours. Inspired by that, this post has a Stars theme. No it isn’t that kind of 3-way, so get your mind out of the gutter. I’m going to give you three components, all related to the theme. 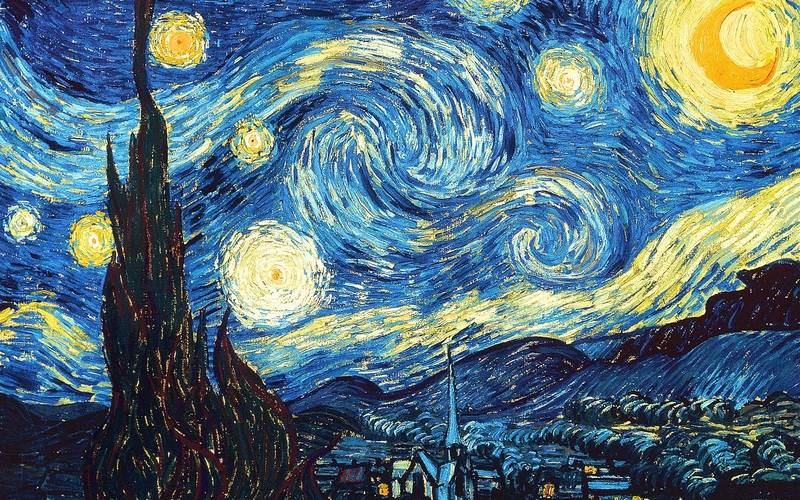 First, I have to include Starry Night by Vincent van Gogh. Certainly one of my favorite artists. Like so many, he was a troubled soul. This was actually painted from his asylum room. While there for about a year, he painted some of his best known works. Next, I offer one of my own creations. Lastly, a song called Stars by Grace Potter. I’ve seen Grace perform with her band, The Nocturnals. She is super high energy on stage and has many rockin’ up temp songs. This is a slow one. Thanks for following! I’m not looking for any link trades at the moment, but thanks for the offer. Ok, gotcha. That list simply shows the last blogs I have followed. I don’t manually update it. Things are added automatically when I follow, which causes those on the bottom to roll off.